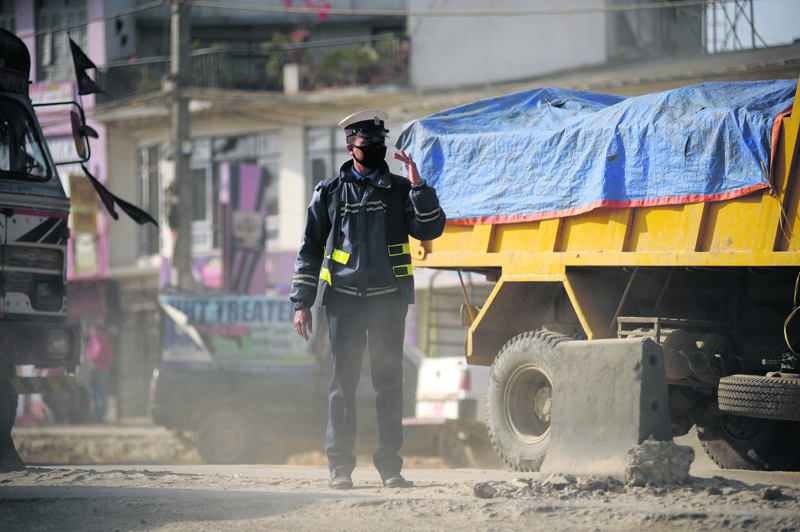 A traffic policeman on duty at a dusty crossroads in Kathmandu in this picture taken in December. KATHMANDU, Feb 17: Standing right in the middle of one of the busiest road sections of Kathmandu, she extended her right hand at shoulder level with the palm facing forward, while simultaneously blowing a whistle. Though clearly in a hurry, all the vehicles facing her palm obliged at her signal, coming to a gradual halt. She then gestured to people waiting at both ends of a zebra crossing to cross the road. She also helped a motorist who seemed to have lost his way. Though clearly exhausted and tired from standing all day, traffic policewoman Muna Shrestha was not deterred from performing her duty and played a catalyst role in managing the traffic flow at Putalisadak junction. What makes her job difficult is the hazardous level of dust and vehicle emission that she has to face on a daily basis in one of the heavily polluted spots in the country's biggest city. Traffic personnel like her have to manually manage the traffic as most traffic lights in the Valley are dysfunctional. “It's not easy doing our job. Not only do we have to stand the whole day, we also have to put up with the dust and harmful vehicle emission,” said Shrestha, expressing deep concern over the vulnerabilities her health is exposed to. Like her, about 1,000 personnel managing traffic in the Valley are at high risk of a variety of pulmonary and cardiovascular diseases due to the heavy concentration of pollutants, especially minute particulate matter measuring 10 and 2.5 microns and even less. These particles are roughly 30 times smaller than the width of a human hair and can easily get lodged in the lungs and then in the blood supply which circulates throughout the body and affects the cardiovascular system, according to Dr. Khem Bahadur Karki, member secretary of Nepal Health Research Council (NHRC), an apex body at the Ministry of Health. A level of 2.5 microns exceeds the limit set by the World Health Organization by five times. “On-duty traffic personnel are the worst sufferers of air pollution. Unlike us, they have to stand at busy crossroads and junctions most of the day to manage busy traffic. These crossroads and junctions are the places with the highest levels of air pollution. And they naturally inhale more emission than us,” Dr Karki said. Despite the high risks, traffic personnel are only provided with plain masks that do not filter out the harmful particles. “These cloth masks are virtually useless. Only N95 masks that have special filters are effective. However, it is expensive and hard to find in the market,” added Dr. Karki. Such masks can cost Rs 2,000 and above. 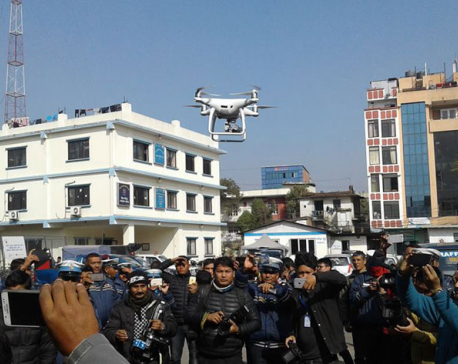 SP Lokendra Malla, spokesperson for the Metropolitan Police Traffic Division, said they are not responsible for upgrading the masks of traffic personnel, though he agreed that they are facing severe health hazards. “We do not have the budget and it's the government's responsibility to take care of our health,” he added.